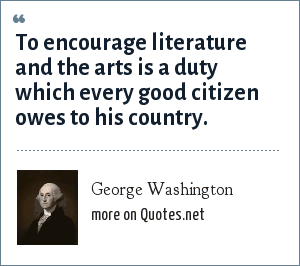 George Washington: To encourage literature and the arts is a duty which every good citizen owes to his country. לעודד ספרות ואמנות היא חובה שכל אזרח טוב חייב לארצו. 문학을 장려하고 예술은 모든 선량한 시민이 자신의 나라에 빚진 의무입니다. "George Washington Quotes." Quotes.net. STANDS4 LLC, 2019. Web. 23 Apr. 2019. <https://www.quotes.net/quote/8720>.